Wow, we really do not think there is a single person on Earth who would not be impressed with this just drop dead gorgeous summerhouse. 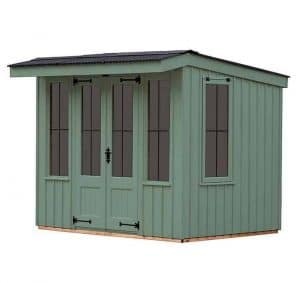 Crane have done an amazing job with their National Trust line of sheds and as you can see here they are also trying to take over the world of summerhouses as well! 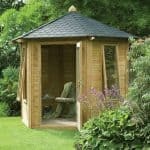 What makes this so special is that Crane have been to various parts of East Anglia, researching old style, traditional English style summerhouses and the work they have put in has paid off as this grabs your attention the moment you look at it. Those large windows with the cross lead in them, that apex style roof which as well as looking like a million pounds will make sure no water gets in your summer house. And at 8 x 8, you have a good amount of space without it taking over your whole garden. 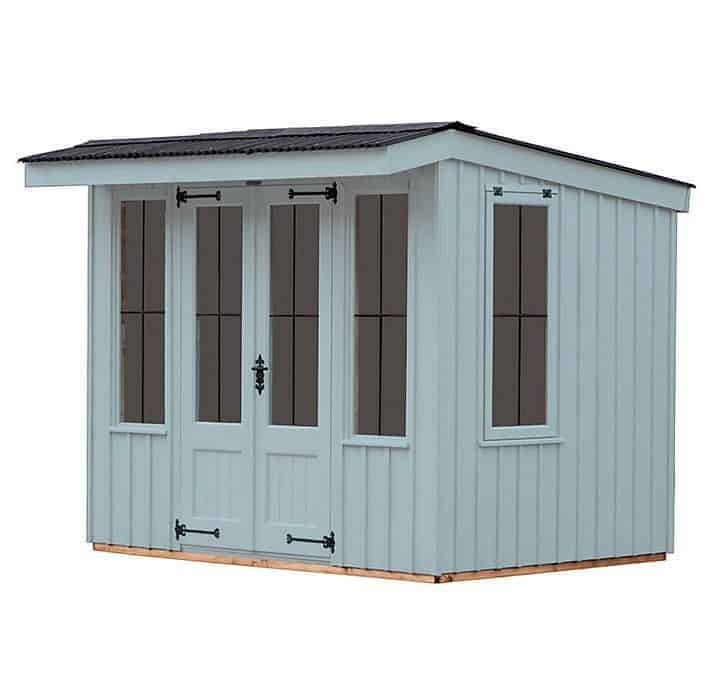 As soon as you see this summerhouse we are certain that your minds (just like ours did) will start racing with what exactly you can use this for! It is just under five grand! Ok so calm down put your bank card back in your wallet and stop salivating over the photos! 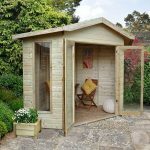 This is a summerhouse that really does make a very amazing strong first impression, but here we are getting into every nook and cranny so you can see if this summerhouse is worth the high price tag. 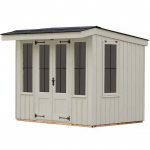 This is in the mid-size range of what Crane offer this summerhouse in and it offers a very nice amount of space inside the summerhouse. 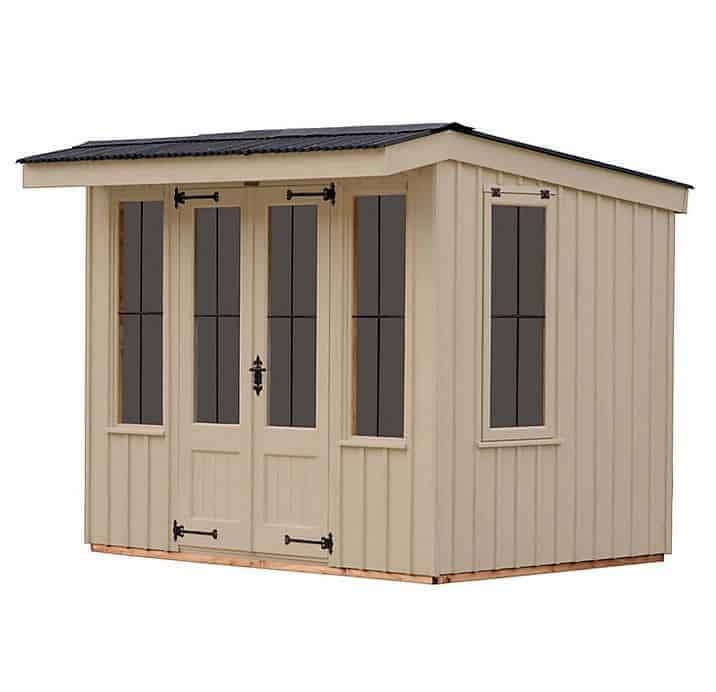 At the eave you have a have a height of 5 feet 9 inches with the front of the summerhouse being over 7 feet in height. Inside, you have 7 feet 8 inches of room for both the width and the length which is more than enough for a couple of chairs, a table and if you want to run some electricity in there a little TV and a mini fridge for your beverages….. now that is living the dream! You really will have a very nice amount of space where you can just kick back and get away from the rest of the world inside this summerhouse. The roof is very well designed and something we got a huge kick out of when we first saw it. 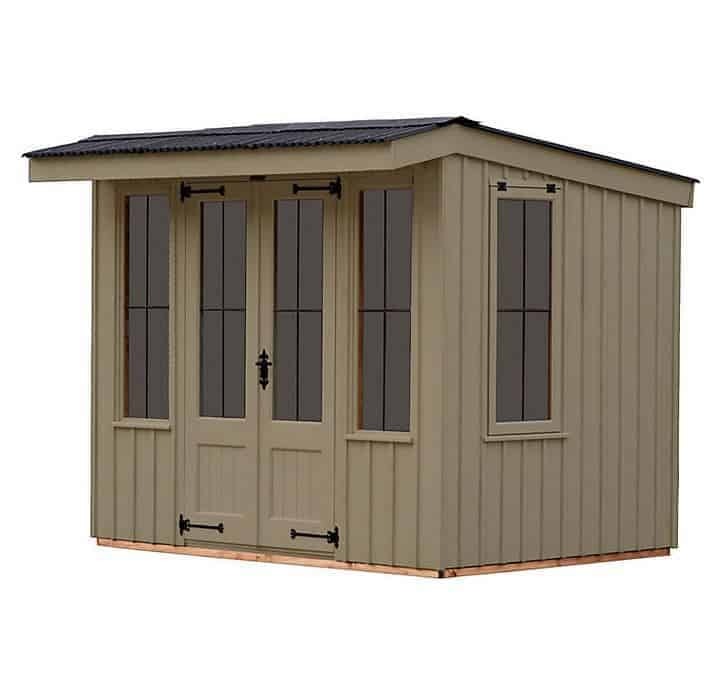 This is an apex style roof, but the front and the back are at different heights which first of all makes it look more like an actual little house than just a shed, but it also means that thanks to that corrugated roof, no rain will be getting in there and spoiling your good time! 19 x 125 tongue and groove roof boarding is used to keep the corrugated roof up there, but that is not a concern of yours….. why? Well this summerhouse actual has a ceiling! This summerhouse has a very nice, pine tongue and groove ceiling which was a huge surprise for us and we must say….. we love it! So much better than just having to look at the roof boarding. One of the staples of this National Trust line of garden buildings that Crane are producing is the sawn board cladding that they are using. Giving the summerhouse a very, for lack of a better term, uniform kind of look. Tt really does give the building a very classic, East Anglian English kind of look to it. This is not cheap sawn board cladding that was purchased round the back of B & Q! This is specially imported, Scandinavian Redwood that Crane are using and it is very strong and at 12 x 150 mm and topped with 16 x 38 mm it is going to be as strong as a bull! The cladding may seem kind of “old school” but that is the point of this line of sheds. We think this kind of cladding works wonderfully well with the corrugated roof. The frame that really holds the summerhouse together is made from that same, hard as nails, Scandinavian Redwood and it is nice and thick at, 38 x 50 mm. Once you see how nice this looks once it is built, you clearly will want to spend a vast amount of time in here and thankfully the sturdy frame is going to last for many, many years. Framing is where more than a few sheds and summerhouses we have seen over the years tend to “fall apart” but this Scandinavian Redwood will make sure it will stay strong and firm! Crane know people who will be buying this summerhouse will plan on putting some nice and comfy chairs in here and a few other items as well. So they have made sure that the floor is nice and strong. As we expected, Crane are using the same kind of boards that they used for the roof. This is 19 x 126 mm tongue and groove floor boarding and it will be sitting on 38 x 50 mm floor joists. Now we are not saying you can use the summerhouse for weekend breakdancing competitions (actually you probably could), but this floor is very strong and will feel nice and sturdy under your feet. When you are spending nearly five grand on something, you really should know what the deal with the warranty is. 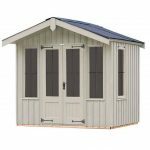 Crane offer their standard, 2 year warranty with The Flatford Summerhouse. 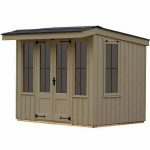 This is such a nice looking summerhouse that we are sure most people who buy it will be taking as good care of it as they do there house. With that being said, Cranes warranty only covers you for what they class as “general wear and tear” but if something does go wrong with it and you are still under warranty they will come and fix or repair it. Now here we have two of the most stand out features of the Flatford Summerhouse! The doors are huge double doors! The size of the doors when opened is, 1830 mm wide and 1100 mm high. So in other words, you could put a couch in here no problem at all! The doors also have windows in them these are made with 4 mm thick toughened glass and to really make them pop they have a lead cross in them. To really finish the doors off in style, Crane have used some black, Fleur-de-Leys hinges and the door handle is in the same style. Counting the two on the doors this summerhouse has six windows! The two on the sides actually open as well. So in those hot summer months (well hot two weeks of summer that we get these days) you can have the doors and windows open and get a nice breeze going in there. These windows are slightly larger than the ones on the door (just a couple of inches) and they are made with that same 4 mm thick glass with the lead cross in them. One other little feature that we liked……. But are sure most other people may over look is the hinges for the windows they are that same black style as the hinges used on the door, we love that kind of attention to detail. You will get a nice mortise lock with the this summerhouse that comes with a key. Not only does this keep your summerhouse locked up and secure it is also done in the same black style as the hinges and door handles! Privacy may be an issue for some, but we would think that most people who buy a building like this will buy some curtains or blinds. We think that Crane have a nice selection of colours for people to choose from. There are six to pick from and the choice is very varied. For example the Wades Lantern style gives you a more “natural” look. Whereas if you want something a little bit more colourful then there is Painters Grey which is a nice, bluey type of grey. 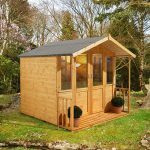 Everything from the corrugated apex style roof, Scandinavian Redwood and those 4 mm thick toughened glass window, the Flatford Summerhouse is just high quality through and through. Scandinavian Redwood is kind of like the Arnold Schwarzenegger of wood it is tough and it will last for a very long time. 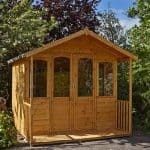 The extra tough windows, corrugated roof and just the time and care that is put into the construction mean, you have a summerhouse that will last for many years. At 8 X 8, you have a good amount of space here. We think that you could fit in some chairs, a table and whatever else you would need to relax and you can do it without the structure taking over your whole garden. As Crane are the ones who will install this for you, we have to give it top marks. 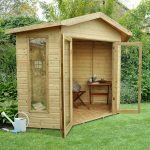 As they install it, you have no worries about the summerhouse not being built properly. 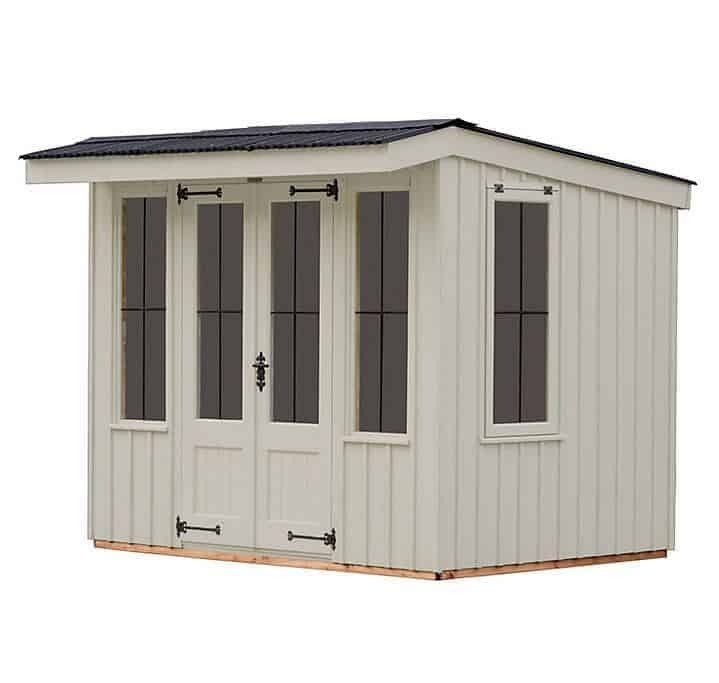 Look this is one heck of a lovely looking summerhouse that would impress anyone who sees it……… but that price! We have seen DIY extensions you can buy for your house that come in at under £5,199.00. Final Thoughts: Look this is the kind of summerhouse that in an ideal world we would all have in our garden and be able to sneak into for a cheeky glass of wine on a nice summer night. But this is a very expensive building and we cannot overlook that. It is made from great materials, will be well built, last a long time….. but again it is very expensive. 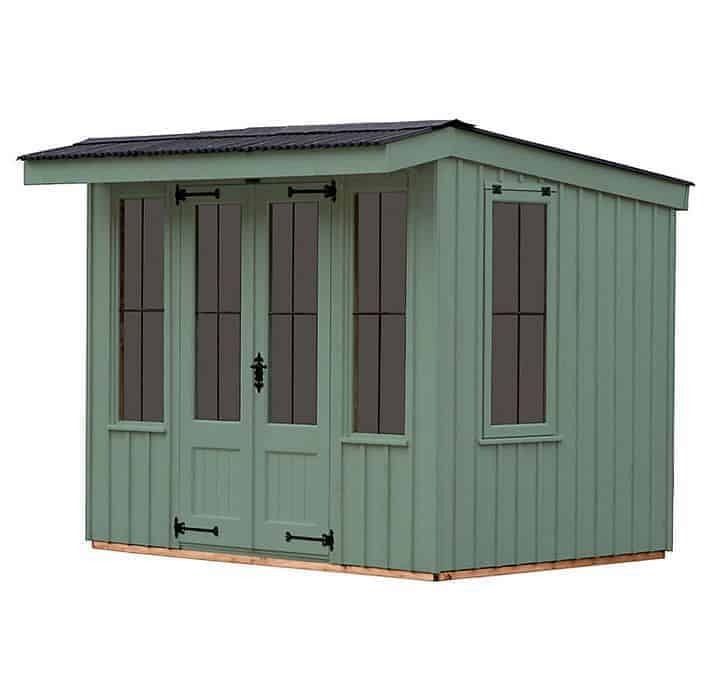 Still if you can afford it we think this is a summerhouse that would look amazing in any garden!